Here’s a black and white photo that I rarely get tired of looking at. It was shot in a subway station in New York City while waiting for another subway. I think what I like about it is that you can travel around the photo and see different subjects. 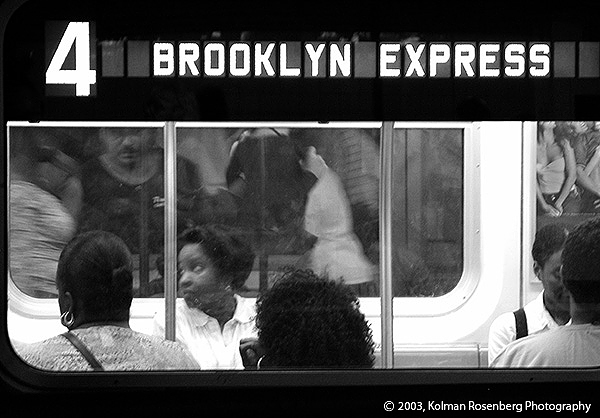 The woman whose face we can see and her expression, the man’s face showing thru the window on the other side of the subway, the backs of heads, the bustling, moving bodies on the other side of the subway, the partial bodies on the sign on the right in the subway car itself, and of course the “4 Brooklyn Express” sign on the side of the subway car tying everything together. I keep thinking that one of these days I’ve got to try to find similar types of shots in Cleveland’s Rapid Transit System. This entry was posted in Uncategorized and tagged #4, Black and White, Brooklyn, city, Cleveland, Express, expression, monochrome, New York, NYC, Rapid, rapid transit, Subway, Train, Transit, Transportation. Bookmark the permalink.